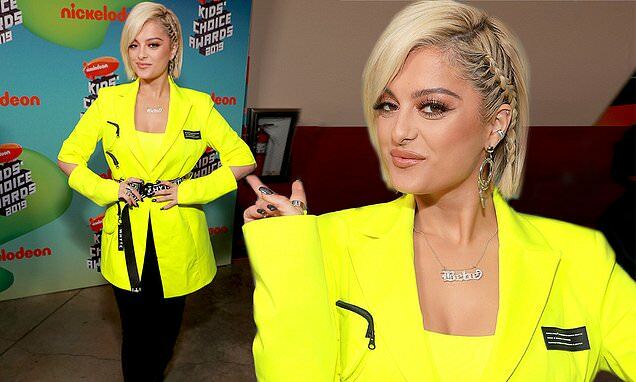 The 29-year-old singer, nee Bleta Rexha, wrapped herself in an eye-popping neon yellow blazer with a monochrome Whyte Studio belt. Accentuating her features with makeup, the New Yorker slipped into black trousers and wore her platinum blonde hair in a bob. Whilst at the awards show, Bebe could be seen standing for the shutterbugs alongside singer and Oscar-winning actress Jennifer Hudson. Jennifer slid into a high-shouldered white top and a high-waisted pair of orange slacks that featured feathery trim running down the side of each leg. Bebe got in quite a bit of mingling at the awards show, posing with 19-year-old The Chilling Adventures Of Sabrina actress Kiernan Shipka.